Each year thousands of newcomers begin some sort of bodybuilding program, but a majority of them are unsuccessful. It's no wonder; far too many just show up at the gym and lift, which may—or, more likely, may not—be the best and fastest method to make gains. Those who succeed tend to follow a well-formulated plan. In fact, we guarantee that if you incorporate our best mass-building training tips below—which we put together with the help of IFBB physique pro Craig Capurso—you'll be on track to make big muscle gains. So what are you waiting for? Let's get bigger! If you're looking to hoist serious poundages, you'll sabotage your chances if you short-change your warm-up. What's more, the stronger you are, the more warm-up sets you'll need. That helps not just the muscles push more weight but also the tendons and ligaments that have to support that heavier resistance as well. A good 5-10 minutes on the bicycle preceding your first light-weight sets is an effective way to kick off your training session and get the blood pumping. Remember, a warm muscle is better capable of lifting max weight—and less likely to become injured. A common question every beginner asks is, "How much weight should I use?" The answer depends on your goals. Warm-up sets aside, when your goal is to build strength, your heavy sets should be done for fewer than six reps. If your goal is building muscle, choose a weight at which you reach muscle failure between 8-12 reps. And for emphasizing muscle endurance, go with a weight that allows you to do more than 15 reps. Some folks spend hours a day working on a single body part. Others insist they need only one set per exercise. So what's the best amount? While there's no magic number, doing 2-3 sets of a given move works best for most beginners; 3-4 sets for more advanced athletes. The focus here is on volume—the total number of sets and reps completed for a given muscle group. Bodybuilding for muscle growth concentrates on fairly high volume, though too much risks overtraining. Start off with about 12 sets total—say, 3 sets of 4 exercises—for larger muscle groups like chest, back, and legs, and 6-8 for smaller ones. As you progress, you can handle more sets (volume), but you'll want to extend the number of days before you train that body part again. When getting into position on standing exercises, do what athletes in all sports do: Adopt an athletic stance. Your feet should be about shoulder-width apart, toes pointed slightly outward, knees bent (soft), torso erect (chest out, shoulders back, low back slightly arched) with your head looking forward. This is a natural, stable, and strong position, and it should be a starting point for you when get into position for almost any standing exercise. "Make sure you're taking ample recovery time between sets in a mass-gain phase," says Craig Capurso, IFBB pro physique competitor and Cellucor athlete. "I don't look to limit rest times when max muscle growth is the name of the game. I want to be recovered enough to push the weight as many times as I can, not stopped by a muscle that's not sufficiently recovered from the previous set. You need sufficient rest in between sets to be able to push maximal loads." In your efforts to stimulate muscle, you need to be somewhat aggressive. Muscle fibers adapt fairly quickly, and the effectiveness of a once-challenging workout can quickly fade. This means you should continually increase the challenge—so long as you maintain good form—and never fall into a comfort zone. By progressively increasing the overload over time, you'll continue to make gains in size and strength. For most lifters, changes to their training programs helps keep workouts fresh. Speaking of making changes, one very easy and effective way to do so is to simply try a different grip from what you're used to. If you've typically done an exercise with a wide, overhand grip, flip it and use an underhand grip instead. This approach can work with bench presses, lat pulldowns, bent-over rows, barbell curls, and triceps pushdowns, among other exercises. We've all seen him: the poor guy doing curls while teetering on a wobble board like Mr. Magoo in an earthquake. Strength training is important, and so is balance. But when you're trying to add size, keep them separate. Forget about doing squats on wobble boards, dumbbell presses on exercise balls, or standing on one leg while curling a weight. Besides making you looking like a fool, neither your core nor the target body part will be fully stimulated. Your best bet is to focus on one activity one day, and the other the next. Besides, you'll be able to push much more weight when grounded on a stable surface. Few of us were born with low body-fat levels that give us that natural V-taper, so how do you create the illusion of a small waist if you've got a more blocky physique? Emphasize your upper back and middle delts to a greater degree in your workouts. Do a few more sets of wide-grip movements on back day, and a few extra sets of upright rows and lateral raises on shoulder day. Bonus: The width will make your waist appear smaller. Sure, you have a number of training options when it comes to doing a particular exercise, but if you want the biggest challenge, opt for dumbbells. Unlike with barbells and most machines, which allow a stronger side to dominate, dumbbells require both sides of the body to do an equal amount of work. Dumbbells are also especially easy to get to when the gym is busy during the early evening. If you've been favoring particular barbell exercises, achieve a slightly different training stimulus by substituting its dumbbell cousin. A lot of folks at the gym use bad form, which usually puts pressure on surrounding joints while taking stress off the target muscle. But when done right, cheat reps can make the target muscle work harder. The purpose of cheating is to stimulate the muscle fibers with greater intensity, not less. That's best done by completing 6-8 reps on your own with good form, then adding just enough momentum to pass the sticking point for a few more reps. If you have to cheat right from the very first rep, though, the weight's too heavy. 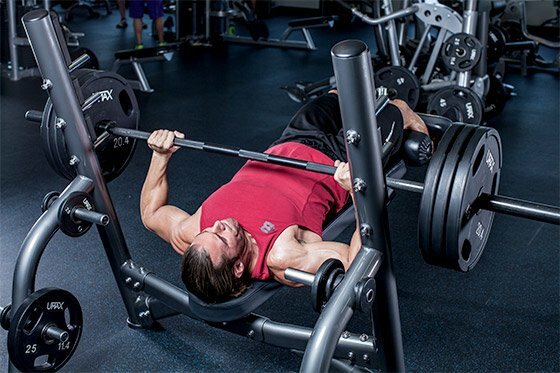 Dropsets (repping to failure, then continuing with progressively lighter weight) are a great way to induce a deep muscle burn on the last set of a given exercise, and are especially useful for precontest bodybuilders looking to burn a few extra calories. Dropsets are a time-tested approach that really ignites a muscle burn. For example, if you're curling with 35-pound dumbbells, do your set, then immediately place the weights back on the rack and grab the 30s. Do as many reps as you can, then replace and repeat with the 25s. Squeeze out as many as you can—and it may not be very many—all the way down until you reach the 15s. Light weight never felt so heavy! 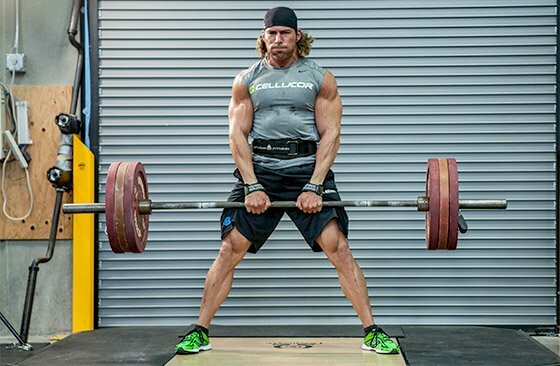 What makes the deadlift from the floor different from other exercises? You do it from a dead stop. With other exercises, you generate elastic energy—the energy that helps you lift the weight during the initial stages—when you reverse direction at the bottom. When you remove that elastic energy by momentarily resting the bar on the floor, the movement is much harder. This is also a great way to build strength over the lower portion of the range of motion. Try this: Set the safeties in a power rack at the lowest point in the range of motion for a given move (i.e., the bottom of your squat). Each rep begins from the bottom—not the top. Make sure you momentarily let the bar settle on the safeties on each rep before pressing back up to remove that elastic tension. Supersetting two exercises is a common method to speed up your workouts, but when you do it for opposing muscle groups, research shows you can get an added bonus: You'll be slightly stronger than normal on the second exercise in the grouping. Pair exercises for antagonist muscle groups: biceps/triceps, back/chest, and quads/hamstrings. Most of the "big" exercises you do are called compound or multijoint movements—exercises that allow you to push the most weight because more than one muscle group is involved. When doing these kinds of movements, the set commonly ends when one of the muscle groups reaches failure. Pre-exhaust training is an approach that gets around the "weak link in the chain" that brings about premature failure. For example, when bench pressing, the smaller triceps often give out before the larger pecs muscles. To bypass this limitation, first do an isolation exercise like the dumbbell fly, which places very little stress on the triceps. This "pre-exhausts" the chest muscles. Because the chest has already been worked, the triceps are no longer the weaker muscle by the time you do bench presses and you can do the exercise to true pectoral failure rather than triceps failure. What's the easiest way to do a workout makeover? Try doing it in reverse order. You'll still want to start with a good warm-up, but then go right into what's normally your last exercise. You'll be surprised by how much stronger you are when doing it first, because it isn't prefatigued, and you'll be able to do more weight for more reps. Naturally, when you get to the movements you typically do first, you won't be able to go as heavy or for as many reps. Ultimately, you'll work the target muscle in a way it's unaccustomed to, which is a great way to kick-start muscle growth. "For max muscle recruitment, use a high-volume approach," says Capurso. "When I use a very low rep range, I feel like I'm leaving more in the tank. So I've adopted an approach that will be mentally and physically challenging in my attempt to push a load till failure. Most people will fail in the lower rep ranges and feel satisfied, but try taking the challenge of doing multiple sets in the 15-18-rep range. You'll find yourself completely fatigued by the end." Research also supports the idea of adding one last back-off set with a lighter weight you can do for higher reps, flushing the muscle with blood and water to increase strength and muscle size. At the end of a set when fatigue is setting in, using a slightly more explosive motion can help you do an extra rep or two when you otherwise might have racked the weight. Remember to use a strong and controlled rep speed when starting out a set; once you near that last rep or two, start generating a bit more momentum to help you blast through sticking points. Rather than opting for same ol' three sets of 10 on a given movement, try pyramiding your weight on successive sets, stepping up the weight a bit each time. Of course, the number of reps you can do necessarily falls as the weight increases, but you'll realize better gains in strength with the lower-rep sets. Just make sure you don't burn yourself out on lighter-weight sets; don't encroach on muscle failure until you hit your heaviest sets. What's the best way to continue making gains? By finding a workout partner who pushes you, especially one who is bigger and stronger than you. Besides spotting you and assisting with forced reps and partials to help you train past failure, a training partner will also motivate you to hit the gym on days you might otherwise opt for the sofa. If you're stuck training on your own, you can still benefit from training past muscle failure; try these selected intensity-boosting techniques that work especially well for single trainers. Weight belts aren't seen as much in gyms as they used to be, but every serious lifter should have one. While you shouldn't be wearing it on every set—you need to strengthen your lower back muscles—they should be worn on especially heavy sets in which your lower back needs support. I'm talking deadlifts, bent-over rows, standing military presses, and squats. Skip the belt on your lighter-weight sets so your low back has to work and can therefore grow stronger. Using powerlifting bands and chains may appear unnecessary or inconvenient, but they can help you can realize big-time gains, especially when your muscles are unaccustomed to using them. What's unique about these tools is that they provide variable resistance over the course of a single rep. In the down position, the bands and chains unload some of the weight on the floor and are therefore lighter; as you press up, the tension on the target muscles increases. Bands and chains are a great way to attack a sticking point. You've been told never to use wrist straps, so you can work your grip on back day? Nonsense! Once your grip starts to become fatigued, put on those pulling straps. You'll find you can do an extra rep or two on each set, which means greater muscle growth. Don't worry about forearm or grip development; do that on arm day. When it's back day, focusing on pushing as much weight for as many reps as you can—and that means using straps. Though this is in no way a "training technique", many lifters determined to continue to push harder in their pursuit of growth actually undermine their efforts by including too few rest days in their training split. Don't be so obsessed with missing a workout and training to utter exhaustion that you fail to give your body enough time to actually heal—and grow. Likewise, levels of catabolic hormones like cortisol rise quickly in the body over the course of a training session; you should strive to get in the gym and get it done quickly. Work on increasing your workout intensity rather than duration. The frequency with which you should train a particular muscle depends in part on how much work (volume) you're doing. Beginners who don't do a lot of sets for a given body part can train them more frequently (say every 2-3 days). More advanced lifters who do 15-20 sets for a given muscle group can follow a split in which they train each muscle group every 5-6 days. Competitive bodybuilders who often train balls-to-the-wall might go seven days or more before repeating a workout. In these cases, it literally takes that long for the muscle to fully recover between training sessions. When looking for the best exercise to start your workout with, steer toward multijoint exercises; you can lift the most weight early in your workouts, when your energy levels are high. They're called multijoint—or compound—because more than one set of joints is working, which recruits additional muscle groups. 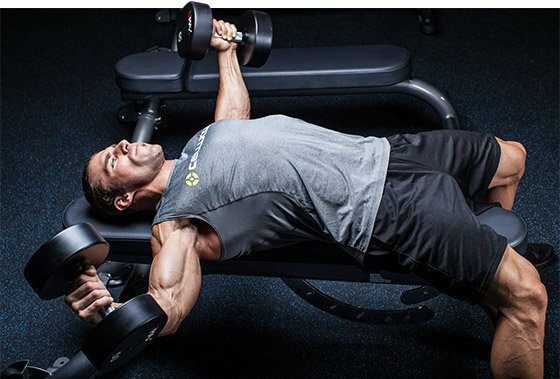 For example, the bench press recruits the triceps and front delts in addition to the pecs. Squats, bent-over rows, overhead presses, and bench presses are the best muscle builders for the legs, back, shoulder, and chest, respectively. Add on other exercises from different angles to fully work a target muscle. Bonus tip: Really challenge yourself with weights you can only do for 6-8 reps early in your workout; once fatigue starts to set in, you won't be able to push those very heavy weights any longer. When devising your training split, be careful about training a given muscle group on consecutive days because—say it with us—a muscle grows when it's being rested in the presence of good nutrition. If you train chest on Mondays, shoulders on Tuesdays, and triceps on Wednesdays, your split doesn't allow ample recovery time. Training back or biceps on consecutive days is also a sign of a poorly designed split. Use rest days and leg days to break up your upper-body training days. Gaining mass is all about taking in more calories than you burn while following the specific training advice presented here. However, if you're a party animal and consume too many of the wrong calories from alcohol or greasy fast foods, you'll sabotage your efforts. Make sure your extracurricular activities (i.e., everything you do outside the gym) are in sync with your diet and your training in order to make the fastest possible gains!